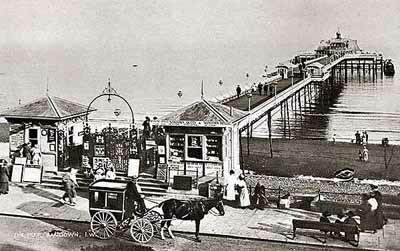 The 360 ft pier at Sandown had cast iron piling and framework with timber decking and opened in 1879. In 1895 the pier was extended to 875 ft with a landing stage for passenger steamers and a entertainment pavilion was also built. The pier was a success with steamers carrying day trippers to and from the Island and also round the Island excursions. During WWI, pleasure steamers ceased to call; most had been commandeered for the war effort. However, the pavilion continued to be used for entertainment. The principle shareholder of the pier company, Lord Alverstone, died in 1915 and Sandown Urban District Council agreed to buy the pier from his estate. After WWI, Sandown once more became a centre for sea-side holidays and steamer services resumed. During WW2, both cruises and entertainment ceased and, as with many piers, a section of the decking and framework was removed so as not to assist any invasion attempt. After WW2, the landing stage need considerable repair and it wasn't until the early 1950's that steamers could again call. In the late 1960's the pier underwent major renovations and alteration, it reopened in 1973. Today, the pier is popular for the entertainment shows it offers, its bars and cafe, children's amusements and arcade.